Homemade marshmallows require unflavored gelatin... flavored gelatin is way more fun. These marshmallows received rave reviews at work, but to be fair, those people will eat anything. Line a 9 x 13 pan with wax paper. Spray lightly with non-stick spray and sift a generous layer of powdered sugar over all the surfaces of the pan that will touch the marshmallows. In the bowl of a stand mixer, sprinkle Jell-O and gelatin over ½ cup cold water. Allow to soften for about 10 minutes. In a saucepan, combine sugar, corn syrup, salt, cream of tartar, and ¼ cup water. Stir until sugar is dissolved and never stir again. Bring mixture to a boil and cover with a tight fitting lid for 2-3 minutes. This will allow the steam to wash any sugar crystals off the sides of the pan. Insert candy thermometer and cook to 240°. Remove from heat. Turn mixture on low and slowly poor syrup into mixer bowl. Continue to mix on low speed until syrup and gelatin mixtures are combined. Slowly increase speed of mixer to high and beat for 10-12 minutes. Add vanilla and beat until fully combined. Resist the urge to scrape the sides of the bowl… you will be sorry. Spray a rubber spatula with non-stick spray and pour into prepared pan using the rubber spatula. Sift powdered sugar over the top of the marshmallows. Allow to set up overnight. Turn marshmallows out onto large cutting board sprinkled with powdered sugar. Cut with knives, kitchen scissors, metal cookie cutters, or a pizza cutter. Whatever you use to cut it will need to be sprayed with non-stick spray and washed often. Dredge the cut marshmallows in more powdered sugar. Line a cookie sheet with parchment paper. Set marshmallows on pan ½” apart. 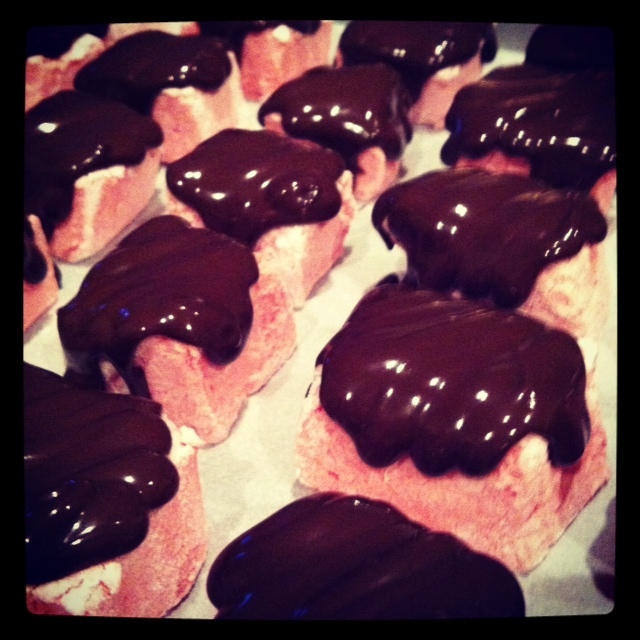 Melt chocolate and drizzle each marshmallow. Store in an airtight container. Posted on January 10, 2013 by Karma in the Kitchen and filed under Candy and tagged Candy Chocolate Happiness.